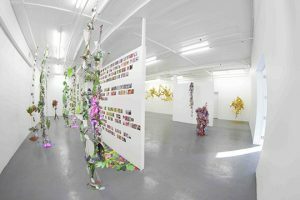 Cutting Edges, a two-person exhibition featuring Chicago-based artist Aimée Beaubien and Boston-based artist Fred H.C. Liang, transforms The Pitch Project gallery space into a paper jungle by manipulating the two dimensional surfaces of photography and drawing into elegant sculptural interventions. Aimée Beaubien’s photographic sculptures are playfully complex. The act of collage gives amusement to the forms interweaving in space. By abstracting representational photographs, Beaubien uses a clearly defined rhetoric of logic and illogic in her creative process. The self-referential objects command an atmosphere exclusive to itself. 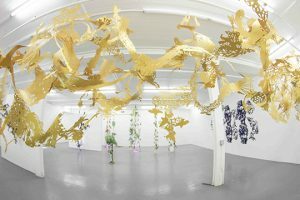 Fred H.C. Liang’s aerial sculptures lend terrestrial beauty to the space. 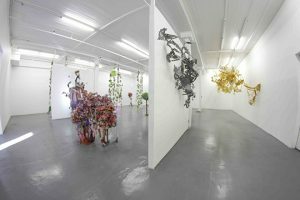 Adopting Jian Zhi paper-cutting techniques, Liang’s work pulls from tradition in attempt to convey the ineffable qualities of abstraction. The meditative process Liang embraces is conveyed through the elemental paper forms that feel almost conscious. Together, Beaubien and Liang’s work create a fantastical environment within the walls of The Pitch Project. Aimée Beaubien has engaged in more than 40 exhibitions national and international, in venues that include: TWIN KITTENS, Atlanta, GA; UCRC Museum of Photography, Riverside, CA; Marvelli Gallery, New York, NY; Castello di S. Severa, Italy; Oqbo Galerie, Berlin, Germany. Her work has been reviewed in publications such as Art in America, Art on Paper, and Art Papers. Beaubien is Assistant Professor of Photography at the School of the Art Institute of Chicago. 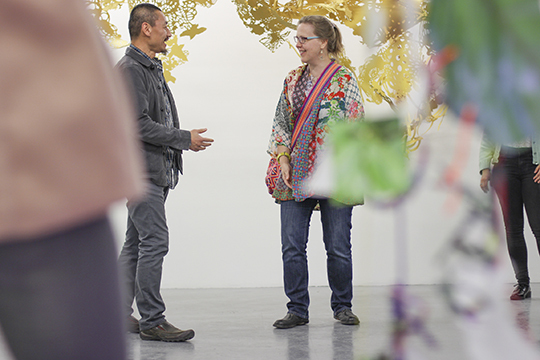 Fred H.C. Liang has engaged in more than 80 exhibitions national and international. Recent exhibitions include: Matthias Küper Galleries, Beijing, China; Pure Land, Carroll and Sons Gallery, Boston, Massachusetts; Inside/Out Museum, Beijing, China; Miami Project Fair, Miami, Florida; Oasis Gallery, Beijing, China. Liang is currently a Professor at Massachusetts College of Art in Boston.